Getting to Green: How's Pharmacy Doing? It's time to minimize pharmacy's environmental footprint. Since the mid-1990s, environmentalists have tried to wrestle our attention from looking at only the consequences of our actions, which address a small portion of our overall impact, to looking at entire processes.5 This approach, called cradle-to-grave (C2G) stewardship, or regenerative design, looks at products’ and services’ entire life cycle to determine the best way to ensure that future generations will be unharmed by our actions. 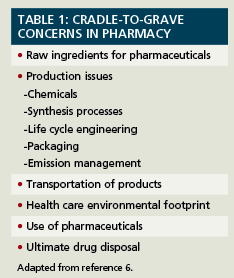 In practice, it means creating an environmentally friendly supply chain that uses recycling, reclamation, remanufacturing, and reverse logistics.2,6 Table 1 lists pharmacy’s C2G concerns. Surprisingly little information is available about hospital and retail pharmacies’ steps toward greater environmental awareness. Some strategies are listed in Table 2. Many pharmacies have failed to take a simple step: placing and using recycling bins for the copious amounts of waste we create. Patients are becoming more aware of the impact their PPCPs have on the environment, but still use outdated and dangerous disposal methods.5 Pharmacists and their associations can increase awareness. For example, the Michigan Recycling Coalition recently identified pharmaceuticals as an area of concern and received a grant to educate consumers. Partnering with the Michigan Pharmacists Association (MPA), they presented a well-received program focusing on strategies currently identified or in use that eliminate medications from seeping into the watershed. Ultimately, we need to encourage reduced pharmaceutical use—commonsense approaches like using prevention rather than treatment.6,9 Ultimately, the solution to sustainability will require all of us to incorporate environmental awareness into our daily practices. 1. EPA’s Lisa Jackson on water quality challenges. July 18, 2012. http://earthfix.opb.org/water/article/us-epas-top-administrator-lisa-jackson-talks-about/. Accessed June 13, 2013. 2. Daughton CG. Drugs and the environment: stewardship & sustainability. National Exposure Research Laboratory, Environmental Sciences Division, US EPA, Las Vegas, Nevada, report NERL-LV-ESD 10/081, EPA/600/R-10/106, 12 September 2010, 196 pp. http://www.epa.gov/nerlesd1/bios/daughton/APM200-2010.pdf. Accessed June 1, 2013. 3. Pinzone M, Lettieri E, Masella C. Sustainability in healthcare: combining organizational and architectural levers. Int J Eng Bus Management. 2012;4:1-9. 4. Rajagopalan S. Healthcare without harm: diagnosing the carbon footprint of healthcare. www.slideshare.net/FrostandSullivan/healthcare-without-harm-diagnosing-the-carbon-footprint-of-healthcare. Accessed June 1, 2013. 5. Xie Y, Breen L. Greening community pharmaceutical supply chain in UK: a cross boundary approach. Supply Chain Management. 2012;17:40-53. 6. Kummerer K, Hempel M. Green and sustainable pharmacy. Berlin Heidelberg; Springer-Verlag: 2010. 7. Pheub K-J. Greening of pharma marketing. Pharm Executive. 1992;12:50-56. 8. Cook SM, VanDuinen, Love NG, Skerlos SJ. Life cycle comparison of environmental emissions from three disposal options for unused pharmaceuticals. Envr Sci Tech. 2012;46:5535-5541. 9. Cue B, Manley J. A greener prescription. Chem Engineer. 2007:52-54. 10. deBraal H. Sustainability in green pharmaceutical production. Pharm Technol Eur. 2009:39-42. 11. Stweart A. Sustainability education, or educating sustainably? eCULTURE. 2009;2:147-154. 12. Morse C. Pharmaceutical waste management: compliance with environmental regulations. Drug Topics. http://drugtopics.modernmedicine.com/drug-topics/news/modernmedicine/modern-medicine-feature-articles/pharmaceutical-waste-management-com. Accessed June 1, 2013. 13. Kummerer K. Pharmaceuticals in the environment. Annu Rev Environ Resour. 2012;35:57-75.